At Austin Shoulder Institute, Robert Graham, MD, and Benjamin Szerlip, DO have extensive experience performing minimally-invasive arthroscopic rotator cuff repair at offices located throughout the North Austin, Texas area, including Round Rock and Cedar Park, Texas. The doctors maintain state-of-the-art techniques aimed at restoring range of motion while eliminating painful symptoms. The rotator cuff is a collection of muscles and tendons that work together to keep the ball-like head of the shoulder joint within the socket, or cup portion of the joint, enabling the joint to function correctly and facilitating an extensive range of motion and strength. 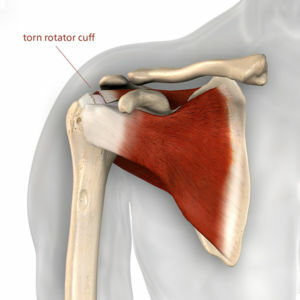 What are the most common types of rotator cuff injuries? Most rotator cuff injuries occur as a result of sports activities, slip-and-fall accidents, or other types of trauma, including car accidents. These injuries can cause partial or complete tears in the tendons or muscles. Other causes of injury include inflammation of the tendons or bursa, small sacs of fluid within the joint, and calcific tendinitis, which occurs when calcium builds up in the joint. Repetitive use of the joint, such as the movements required in different sports or careers can also damage your rotator cuff. What is arthroscopic rotator cuff repair? Arthroscopic rotator cuff repair is a minimally-invasive approach to shoulder surgery that uses special surgical instruments designed to be inserted through small incisions for diagnostic and repair procedures. An arthroscope is a pencil-shaped device that has a tiny camera at one end. When the scope is inserted through a small incision and into your shoulder, it sends video footage of the inside of the joint to a monitor where your doctor studies them or uses them as a guide to repair your shoulder. Arthroscopic surgery is generally preferred compared to traditional open incision techniques since smaller incisions result in faster healing and fewer complications. However, arthroscopic procedures aren’t suitable for all rotator cuff injuries. Am I a good candidate for arthroscopic rotator cuff repair? A comprehensive examination of your shoulder joint including diagnostic imaging of the joint will be able to determine if an arthroscopic approach is the best choice for your needs. IF YOU’RE TROUBLED BY SHOULDER PAIN AND ARE CONCERNED ABOUT A ROTATOR CUFF INJURY, CALL AUSTIN SHOULDER INSTITUTE OR MAKE AN APPOINTMENT ONLINE TODAY.